If you want a simple car garage creeper that doesn’t compromise on features, then this is your perfect purchase. It is manufactured by Torin, a renowned brand in the manufacture of a range of garage and automotive equipment including jacks, car lifts, support stands, presses and so on. The TR6300 blends a great design and top class performance and that’s why it has remained a favorite in many commercial and also private garages. Additionally, it is very affordable and gives buyers real value for their money. This creeper is ideal for those who work for long hours when seated. The Torin TR6300 is simply a seat with a compartment below for keeping your tools. This creeper measures 14.17*14.37*14.37 inches and weighs approximately 9.8 lbs. It boasts a strong and sturdy all-steel solid construction that enables it to support the 300 lbs payload. Besides this, Torin brought on board heavy duty 360-degrees casters that glide very easily. To guarantee comfort during those long hours of work, the vinyl seat has been well padded. 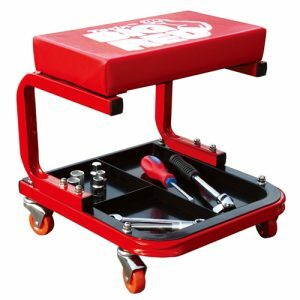 There is also a large tool tray for keeping all your tools together without restricting access to them whenever you need them. The Torin TR6300 Creeper Seat is a great option for anyone looking for a durable and high-performance creeper on a budget. Besides offering comfort and easy maneuverability, it comes with a compartment for storing your tools. With a price tag of less than $30, this creeper is the best purchase for mechanics, whether in a commercial or private garage. Another great creeper that you should also consider getting is the Traxion 1-100. This creeper is from Traxion Engineered Products, a successful company that builds garage tools, truck accessories and outdoor gear among many other products. When it comes to this particular garage equipment, Traxion gave it their best shot. It sports a sleek design with a very wide body, all crafted to guarantee maneuverability and comfort. However, it is quite expensive but worth every penny. Let us see why it ranks among the best. This creeper has been designed to enable you to go under your vehicle and back with ease. 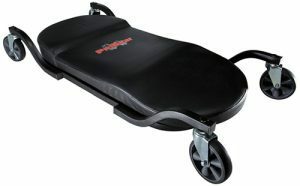 It has a very wide body to allow you lay comfortably and even place some of your tools beside you. It measures 40*21.25*6.5 inches and weighs around 23 lbs. With a ground clearance of 2-inches, courtesy of the outrigger frame, you can use it on trucks and even cars. For seamless maneuverability, this creeper comes with large 5-inch casters and can support a maximum of 400 lbs which is very impressive. When it comes to comfort, the Traxion 1-100 is just the best. It has been designed to offer unsurpassed comfort during the longest work hours. From reviews and online forums, it became a savior for most old mechanics. The main deck has been well crafted cushioning you from discomfort on your torso’s major pinch points. Besides this, the deck is well contoured to adapt to your body which evenly distributes the weight of your body on the deck. The Traxion 1-100 is a superb creeper that will make those long hours under your vehicle comfortable. Traxion understood the importance of comfort and really set new standards as far as creeper comfort is concerned. Even though it looks quite expensive, I must say it is real value for your money. The price is justifiable courtesy of its superior performance and unrivaled comfort. I would buy this creeper over and over again! Our top pick in this review is the ATD 81051 which surprisingly is not better than the Traxion 1-100. I know you must be wondering why. It’s simple; first, the ATD 81051 is not badly off from the Traxion 1-100 in terms of performance. It is among the industry’s leaders when it comes to comfort and safety. However, the ATD 81051 is way much cheaper than the Traxion 1-100. This creeper has a low profile body and offers unrestricted arm movement. Besides, the 300 lbs. load capacity and multi-terrain rubber casters make it a rugged tool for the busiest garages. 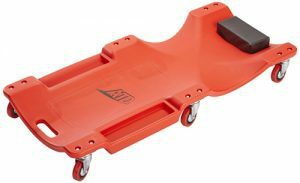 The ATD 81051 has a quite large body deck and a 1-inch ground clearance that gives you the freedom to work on small cars with little ground clearance. It measures 39.75*19*4.25 inches and has a load capacity of 300 lbs which is still quite enough to hold your tools and other light essentials. One great thing about this creeper is the wheels. It has been engineered with six 3-inch casters made from rubber. These wheels will help you in movement unobstructed even in oil, chemicals, and even grease. On wires and other small obstacles, it will still go over them. The deck has been crafted from molded high-quality plastic which may be quite hard when doing very long hours. It has been curved in a simple design that lets your body sink without any discomfort. Another superb feature of this creeper is the arm flexibility. The arm area has been specially designed to allow unrestricted arm movement thus allowing you to work easily under your vehicle. The ATD 81051 is a great creeper in terms of performance and pocket-friendliness. It is a great creeper that offers comfort and easy maneuverability when working under vehicles. Besides, it allows arm movement and is very generous in space and load limit. If you want the best value for your money, then this creeper should top your wish list! Buying a garage creeper can be quite a hassle for first-time buyers. To make things easy, we have listed out the top factors you should consider before buying a garage creeper. Here, you should focus on the wheel size. A good creeper has seamless maneuverability. It should be easy to push and pull and most importantly, easy to control. Price is another important factor. There are cheap garage creepers as well as high-end expensive creepers. Set your budget and narrow down your search to avoid overspending. Also, do a price comparison to ascertain what features you should expect within your budget range. Buy a creeper that has been built to withstand the harsh garage conditions. A good creeper should be strong and sturdy to take hits and falls without getting damages. The materials should also be corrosion free. If you have been having a hard time in your garage, these tools will be very helpful to you. It is very clear that discomfort lowers your productivity will be low. For this reason, comfort is paramount and a creeper is what rings in minds when talking about garage comfort. It allows you to get under your car and position yourself well in order to complete the job. So, if you don’t yet have a creeper, or yours is old and uncomfortable, buy any of the above creepers and you will never regret!